Pools are the place to be in Vegas during the warmer months whether you’re just cooling off in the water or you’re partying it up at the hottest dayclub. The only thing that makes all the sun and fun better is great food and drinks to go along with it. Maybe you’ve been in the water and sun all day and need a snack to refuel. Or maybe you’re someone who prefers to stay fully clothed and in the air conditioning and you just want to grab lunch while enjoying beautiful pool views. Herringbone at Aria has an outdoor patio overlooking the pool. Photo courtesy of Herringbone. 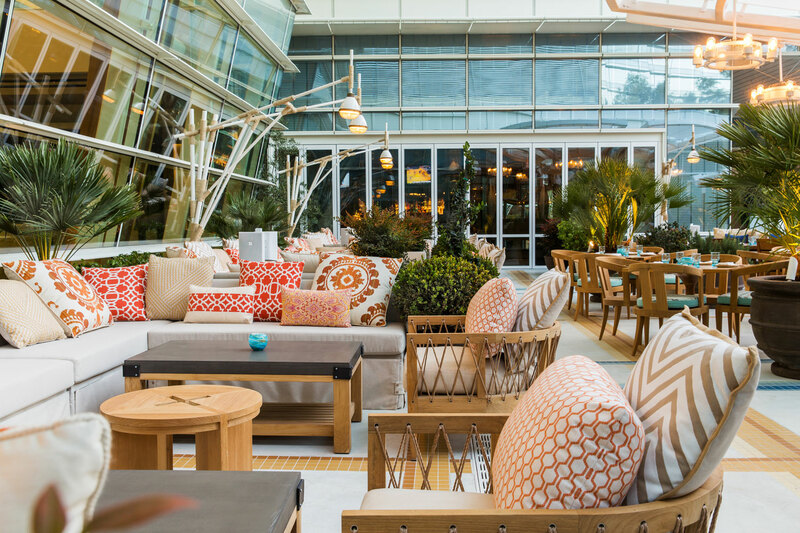 This newly-opened restaurant at Aria features a beautiful outdoor patio overlooking the hotel pool. Grab an ahi tuna burger, meatball sliders, salmon or a hoagie for lunch and enjoy the view. The restaurant also serves a great brunch on weekends that offers dishes like chilaquiles, shrimp and grits, Loco Moco and orange ricotta chocolate chip pancakes. Pair your brunch with Bloody Marys, grapefruit daiquiris or a strawberry ginger margarita. Terrace Point Cafe, photo courtesy of Wynn Las Vegas. Grab a table on the spacious outdoor patio at Terrace Point and take in the views of the pool and surrounding gardens. Dine on breakfast, lunch and brunch favorites. For breakfast, try croissant French toast, crab Benedict or crispy fried chicken and waffles. Lunch dishes include sandwiches, burgers, blackened sea bass tacos and salads. We suggest you save room for one of the restaurant’s triple thick malted shakes that come in flavors like chocolate caramel nut, orange cream and s’mores. The Pool Café is located on the hotel’s 8th floor pool deck, photo courtesy of Mandarin Oriental. The Pool Café is located on the hotel’s 8th floor pool deck and offers casual dining adjacent to the pool along with views of the surrounding Strip hotels. The café serves breakfast in the mornings including breakfast burritos, smoked salmon, omelets and pastries. The lunch menu features small plates like a mezze platter, ceviche and grilled artichoke. Entrees include salads, sandwiches, burgers, shrimp tacos and skirt steak quesadillas. 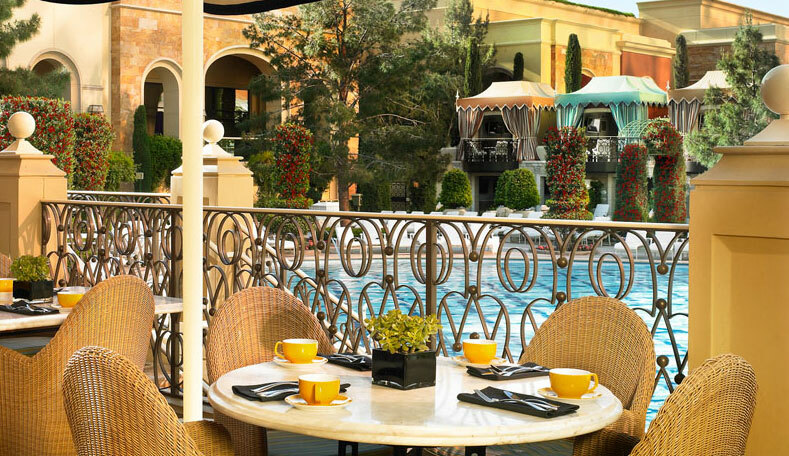 The Pool Café at Bellagio overlooks the lush landscaping and pool at the hotel. Start off with breakfast favorites including steak and eggs, cinnamon brioche French toast, cold cereals, oatmeal and eggs Benedict. For lunch there are a variety of options such as Asian chicken salad, all-beef hot dogs, a turkey burger, fish & chips and pizzas. A poolside meal calls for cocktails and you can get everything from a glass of wine and a piña colada to a 50-ounce pitcher of punch. 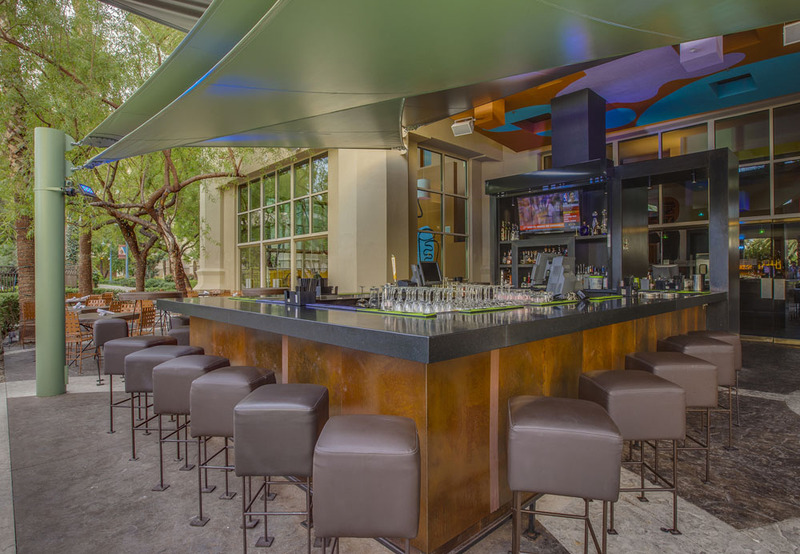 Border Grill’s outdoor patio at Mandalay Bay, photo courtesy of Border Grill. Mandalay Beach is one of the most amazing pool areas in town with its lazy river, sand beach and waves, so who wouldn’t want to dine outside next to it? Head downstairs to Border Grill’s outdoor patio and bar and enjoy. Watch people float leisurely by while you sip a margarita or a mojito. Nosh on tacos, ceviche, salads, tamales and more from Food Network’s “Two Hot Tamales” chefs Mary Sue Milliken and Susan Feniger. 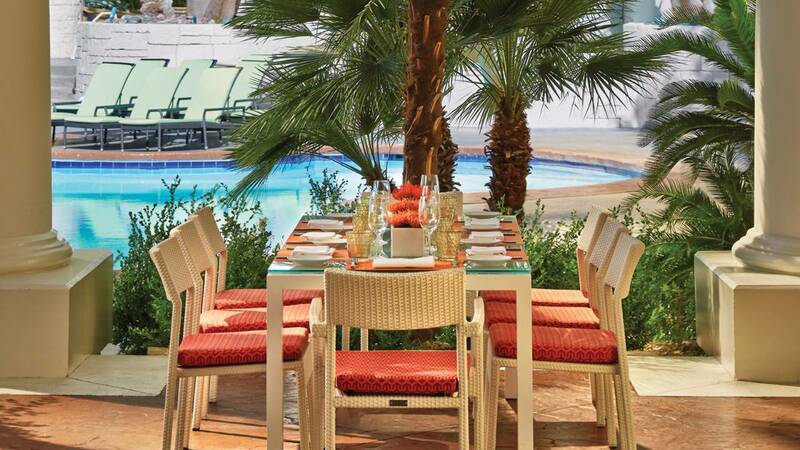 The restaurant also hosts fabulous backyard barbecues throughout the summer with special food items and drinks before Mandalay Bay’s beach concerts. The Beach Cafe at Tropicana offers outdoor dining overlooking the pool. Photo courtesy of Tropicana. The Beach Café offers indoor and outdoor dining. We always opt for the wooden deck outside overlooking the lush Tropicana pool. The restaurant is open 24 hours so you can grab breakfast, lunch, dinner or a late-night snack. Signature breakfast items include the Frosted Flakes cinnamon French toast and the Cuban breakfast sandwich. For lunch and dinner you’ll find things like salads, sandwiches, seafood and pasta. If you’re up late, check out the late night special, a 10-ounce T-bone with a choice of two eggs, potatoes, toast or mashed potatoes and seasonal vegetables. The special is $16.95 and is available 11 p.m. – 6 a.m.
Dine on the patio at Veranda overlooking the Four Seasons’ pool area. Photo courtesy of Four Seasons. When we’re at Veranda, we like to head outside to eat on the patio overlooking the Four Seasons’ quiet, secluded pool area. The restaurant serves fresh Italian cuisine. Lunch items include wood-fired pizzas, shrimp tacos, paninis and sandwiches and pastas. For dinner you’ll find braised beef short ribs, branzino, salmon and chicken. Veranda also has a fabulous weekend breakfast buffet with an array of delicious choices like s’mores French toast, chicken and waffles, huevos rancheros and homemade pastries. The rooftop Boulevard Pool is a great spot to hang in the summer and the Overlook Grill, as the name suggests, overlooks all the action. The restaurant has indoor and outdoor space and serves up American favorites for breakfast and lunch. Some of our favorites include chicken fried steak, spicy blue crab lettuce wraps, the California BLT Benedict and the warm monkey bread with pecans. Bottomless mimosas are available for $18 a person, with the option to upgrade to rosé sparkling wine for $24 a person. We also recommend the Obnoxious Bloody Mary made with chipotle-infused Stoli vodka, house Bloody Mary mix and lemon juice. Soak up the sun at the Trump Hotel’s pool and then grab a bite at poolside restaurant H2(EAU). Serving breakfast and lunch, H2(EAU) features a menu of American favorites including things like spicy chicken sliders, chicken tenders, club sandwiches, Angus burgers, Cobb salads, tacos and a variety of fruit smoothies. Frozen and signature cocktails, including a mango margarita, red berry sangria, and pineapple mojito are available as poolside refreshments. 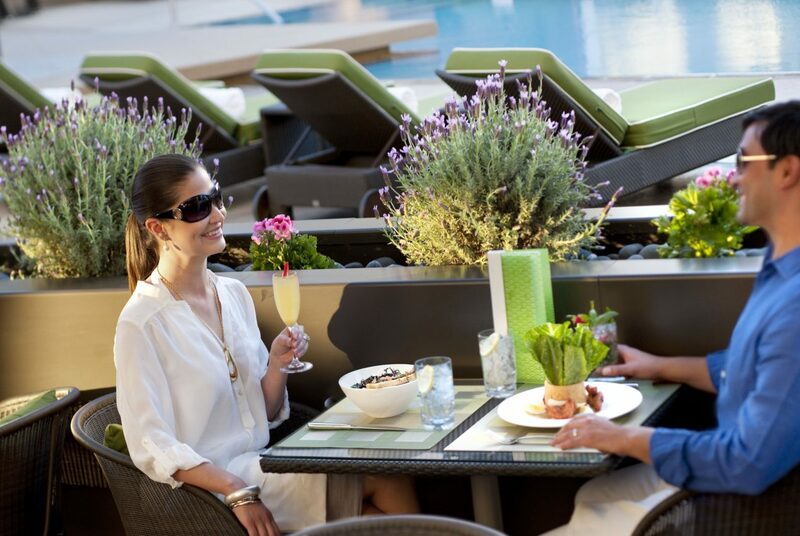 Relax and grab food on the pool deck at Downtown Grand, photo courtesy of Downtown Grand. 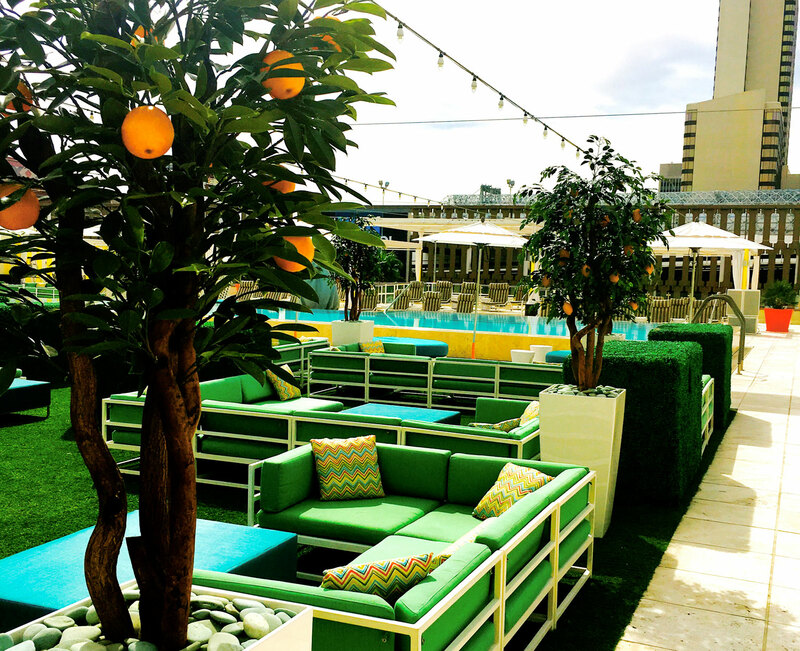 The 35,000-square foot pool deck at Downtown Grand is a rooftop retreat with a pool, bar, cabanas, fire pit and grassy area with outdoor games. The experience wouldn’t be complete without food and you won’t be disappointed. The menu features starters like chips and guacamole, shrimp fritters, chicken wings and spicy marinated shrimp. You’ll also find heartier fare like sliders (beef, grilled chicken, chilled crab or egg salad), beef, chicken or veggie skewers, ceviche tostadas and the Citrus Signature Slaw, made with fresh ingredients grown poolside in one of 12 organic herb gardens. We also love the fresh fruit offerings — minted frozen citrus, watermelon and frozen grapes. They’re a great way to keep your cool at the pool.